The KRB Bundle Conveyor is another development in our material handling line. This conveyor allows built bundles to be delivered to benders or bins downstream. 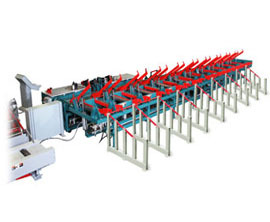 The conveyor can be configured to discharge to either side, or both sides. We can configure a system to feed benders or to discharge straight stock to bins. Reduce crane lifts and keep your shear building bundles while the material is conveyed downstream. No more waiting for cranes to unload the bins. Reduce crane operator time, increase safety and eliminate bottle necks in your shop. Another way KRB is helping you cut, bend and handle more rebar.